I wrote the blog post below over seven years ago. I intended to post it while I was traveling abroad in Europe, but the trip was canceled and I never made it. Somehow the post has remained drafted in WordPress despite once losing my entire site to Ukranian hackers (or something), so I thought I’d share it today. 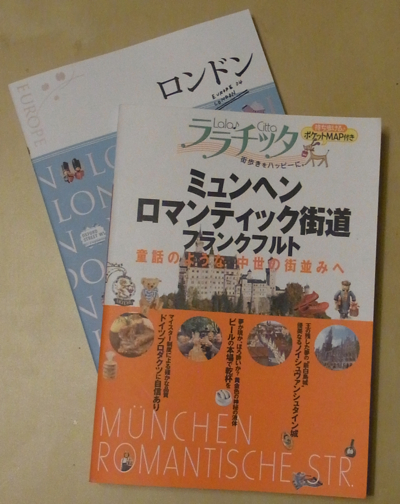 I wish I would’ve had access to a larger selection of travel guides to choose from, and I’d really be more comfortable carrying around a paper copy, to be honest, but the 地球の歩き方 for London and the るるぶ for Paris have helped provide decent overviews for the cities, and I’ll spend the next two weeks planning out the details of a new trip I’ll be making to Europe in October! And then I fly back home on October 19. I’m excited! 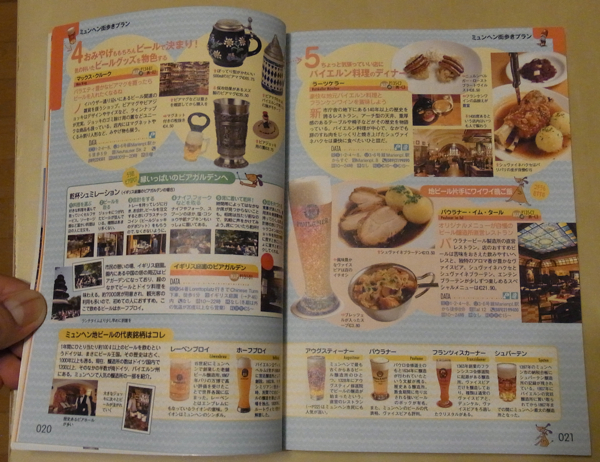 On the previous page there is a walking tour that goes 1) breakfast of white sausages and white beer, 2) Oktoberfest Museum, 3) lunch at Hofbrauhaus, 4) beer omiyage, 5) famous sausages and beer for dinner. No complaints from me. All Japanese guidebooks come with the added benefit of helping you appear Japanese. 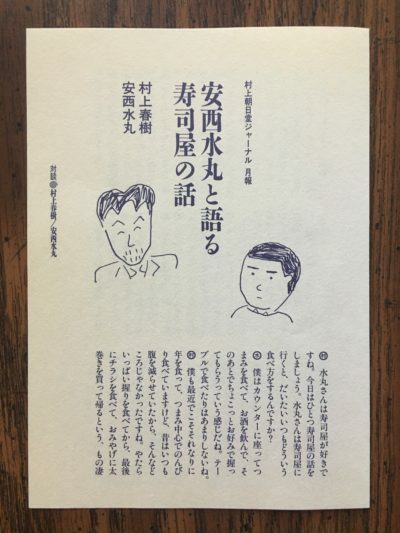 Murakami has a short conversation with his illustrator Anzai Mizumaru (neé Watanabe Noboru of Yoru no kumozaru fame) about sushi restaurants. The conversation seems to be recorded by “Ogamidori-san” (also of Yoru no kumozaru fame), who also chimes in at a few points. Murakami: But Mizumaru-san, the food at sushi restaurants is important, but the clientele is also important, isn’t it. Mizumaru: Yeah, yeah. The clientele is critical. Like, I get annoyed when there’s a bratty little kid next to me who keeps ordering uni. Mura: I’d want to punt him out of there. And I get worn out when there are hordes of gaudy, “bejeweled” women. The delicate flavor of raw fish just disappears when their perfume is heavy. I wish they’d do something about that. Mizu: When I’m waiting on the back seat at Umi in Aoyama for the counter seats to open up, staring at the backs of these “bejeweled” women as they jingle and jangle, that’s enough to get to me. Mura: I’m starting to get angry (laughs). And depending on the restaurant, there are a lot of people who smoke. That’s also tough. I wish they’d make the counter seats no smoking. There’ve been a number of times when I’ve gotten up and left because it was so, so awful. Mizu: I also think people should hold off on smoking at sushi counters. It’s a nuisance. I also can’t stand cell phones. 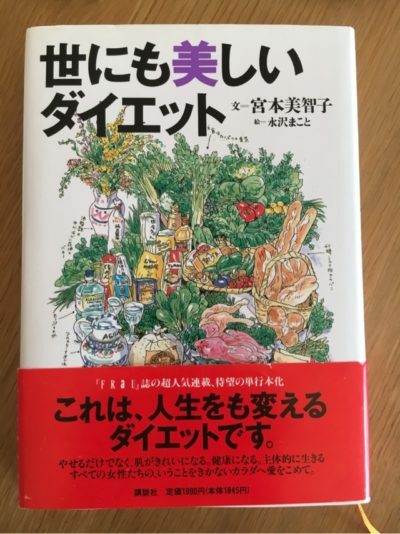 The essays were written from 1994-1995 and published as a collection in 1996, well before the no smoking movement (and even the smoking etiquette movement) gained momentum in Japan. On my first visit in 2002, they still had smoking cars on shinkansen. They may still have them, actually. 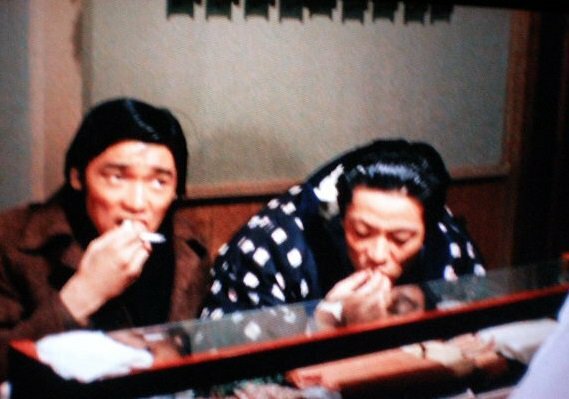 Actor Atsushi Watanabe deftly chows down on some sushi with a cigarette between the fingers of the same hand. Ahh, those were the days. Ha. Back next week with one more excerpt from this interview. We’re continuing on with Murakami’s essay collection Uzumaki neko no mitsukekata. This week I’m looking at 「小説を書いていること、スカッシュを始めたこと、またヴァーモントに行ったこと」 (Shōsetsu o kaite iru koto, sukasshu o hajimeta koto, mata Vaamonto ni itta koto, Writing a novel, starting squash, going to Vermont again), a very short essay. The title basically says it all. Murakami gives another long account of his daily writing routine (go to bed at 9pm, wake up at 5am to write, exercise, have lunch, and then take the afternoon to run errands, relax, or work on other writing projects), talks about how he’s taken up squash, and then visits Vermont with a friend (and talks about the Japanese association of Vermont with curry). However, as I spend days living this introverted life, I have to say that I’m not overwhelmed with the sense that I’m living in a foreign country. Needless to say, I talk with my wife in Japanese in the house (people often tell me, speak English with your wife to improve, but I can’t do that), and I often realize once again, “Oh yeah, oh yeah, I’m in the U.S.” when I go out and hear people I run into speaking English. If you’re sitting at a desk obsessively writing a novel, in the end I’ve come feel like it doesn’t matter where you are. People often ask me “The novels you can write in the U.S. and the novels you write in Japan, they must be very different, right?” But I’m not sure, I don’t think they are that much. People, especially once they get up to about my age, don’t suddenly change, whether it’s the way they live or the way they write, for better or worse. And for me especially, it isn’t like I decide to set my work in a foreign country because I’m living in a foreign country. Besides, I’ve lived a wandering, unattached, moving-obsessed life for a long time (not that I really wanted it that way), so compared to other people my body has become unconcerned with change of place. When I think about it, all of the full-length novels I’ve written to this point were written in different places. I wrote one part of the novel Dance Dance Dance in Italy and one part in London, but I wouldn’t have any idea how they differ if asked. I wrote Norwegian Wood while traveling back and forth between Greece and Italy, but I can hardly remember which part I wrote where. 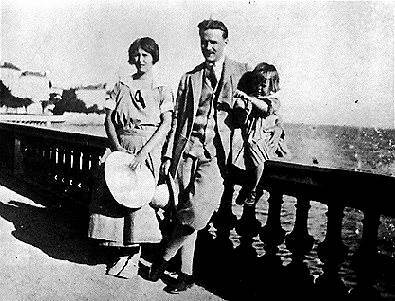 Scott Fitzgerald wrote most of The Great Gatsby in the south of France, but now nobody cares about where this superlative American novel was written. Fiction is that kind of thing. but it wasn’t that great. Murakami gets pretty creative with the text here and actually gives that final clause in a smaller font. Pretty nice. It was tough to recreate in html. I’ve done the best I can. Let me know if you know how to fix it so that I can modify the font size without making it a separate <p>. I’ve said it once already, and I’ll say it again: Murakami writes well for the Internet age. In many ways he was the first blogger…a writer who interacted with readers and played around with his text. The content, too, is nice and light. These are pretty fun reads. Year Ten! Goddamn. When I began this exercise I was living in a very small room in Tokyo, working at a translation company, using Japanese every day. Today I’m sitting here in my modest Chicago apartment (cool breeze coming in off the lake through my living room windows), working during the week at a Japanese office but using the language very little. My reading group, writing for the Japan Times, and translation exercises here are my main connections to the language. Consistency matters, so we continue, even if my feelings about Murakami have shifted over the years and are as different as my living conditions then and now. 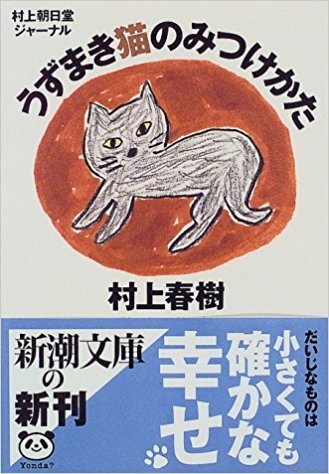 This year I’m (lazily) looking at essays from the collection 『うずまき猫のみつけかた』 (Uzumaki neko no mitsukekata, How to Find Tabby Cats). This is a spiritual successor to 『やがて哀しき外国語』 (Yagate kanashiki gaikokugo, Foreign Languages, Sad in the End [? ]), which Murakami wrote while he was in Princeton. He wrote and published the essays in Uzumaki neko in the magazine SINRA from the spring of 1994 to the fall of 1995. He was living in Cambridge, Massachusetts, and working (I think) as a writer in residence at Tufts University. The essays are chronological and read a lot like extended blog posts. I’m not quite sure which essay generated the title, as I haven’t read the whole collection. I’m picking out essays here and there to read, and it seems like cats figure somewhere in most of them, but never as the central character. I don’t mean to over-insist, but summer in Japan was hot. Hot enough to kill a man. I was pretty dumb to schedule a return trip to Japan during this period, even if I had things to take care of. I wasn’t motivated to do anything so I gave in and drank beer every day. One hot afternoon, I went to see Makoto Nagasawa’s solo exhibit of Tuscany paintings at a Shinjuku department store, and I read a panel displayed there for Michiko “A Beautiful Diet” Miyamoto that read “Drinking alcohol isn’t great for you as you age,” of course expressed in much nicer language. I thought to myself at the time, “That’s true, I should cut back on the beer” (her explanation was really persuasive), but I took one step outside and it was so damn hot that all I could think about was having a cold beer. So, of course, I drank. This summer I mostly drank Kirin Lager. I’m not really a stickler about the brand I drink, but when I was back in Japan, there were so many unfamiliar beers on the shelves of liquor stores and it was so hot that trying to consider all of them was a chore. People like us who don’t belong anywhere have to protect ourselves in every way, and in order to do that, you have to have a somewhat firm grasp on your body to manage yourself and determine your direction, whether it’s through a diet or through physical fitness. There are some sections that read similar to Hard-boiled Wonderland and some of his political speeches about “individuals versus the system” and how the system generally wins. There are many pleasant country inns in Vermont, and hopping around between these lodgings is also fun. It’s the United States, so the food isn’t going to blow you away like it might in Tuscany, but the ingredients are fresh, and the air is clean, and before you know it you’re hungry and can enjoy eating the meals. However, Vermont is known for dairy products and maple syrup, so while they’re delicious, you definitely end up “Not Beautiful.” About 85% of the women I actually met in Vermont were total “walruses.” I was impressed that everyone was able to get so fat. They’re so ponderous when walking around it looks like they have futon strapped to their waists. I’ve been all over the U.S., and this is the first time I’ve seen this many fat people. I wanted to make them all read Miyamoto’s book. This the case, I went without lunch every day, but even so the food was fairly heavy. Traveling is fun, but it gets harder and harder to eat out repeatedly as you get older. Ha. What gives with the body shaming, Murakami? Maybe we can chalk this up to a 1990s lack of political correctness? Murakami doesn’t seem to realize that not everyone can/could just up and run a marathon like he does/did. Or maybe he does and attributes his fitness to a strength of character, which borders on paranoia at times. “This is what I do to maintain my independent sense of self, to maintain my direction and focus.” If there’s a weakness to this system of beliefs, I think it’s a tendency to see oneself (or the system) as flawless. I think most artists need a good portion of this attitude in order to complete any project, but too much of it can perhaps lead to an inability to self-correct…which is maybe what we’ve seen recently with Murakami. This collection, on the other hand, seems to be one of those side projects that Murakami takes on between larger fiction projects. It’s necessarily more casual than his other work. We’ll see more next week!